A tool from the ASQ® developer group, Social-Emotional Assessment/Evaluation Measure (SEAM™) gives parents and practitioners a framework for examining children’s social-emotional development, and noting strengths and areas of concern. There’s even a Family Profile portion for caregivers to report strengths and any additional support or resources they may need to provide the best environment for their child’s social and emotional growth. SEAM can be a valuable addition to any early childhood program’s assessment toolbox, especially if you follow these tips for using the tool with families. TIP: Build trust. If possible, try to have a few interactions with the family before asking caregivers to help complete SEAM or SEAM Family Profile. TIP: Recognize caregiver differences. Not everyone will feel the same level of comfort or candidness. Keep in mind that a person’s individual culture, values, parenting style, and other characteristics or may affect how they respond to the process, and to the assessment items. Get to know them, ask questions, and be open-minded. Like SEAM, SEAM Family Profile includes benchmarks and corresponding items for each of three intervals: infant, toddler, and preschool. But the Family Profile is designed to gather information about the strengths and needs of the caregiver as it relates to their child’s social-emotional development. TIP: Administer it in a way that works best for the caregiver. This may mean they complete it independently, or during parenting groups or classes, or in an interview setting. Even though items are written in language that is easy to understand, most practitioners prefer to offer an interview because it allows for real-time interaction with families. Sheila Zickefoose, an independent practitioner who works in the WV Birth to Three system (Part C), uses SEAM to assess kids who demonstrate risk factors, or whose ASQ®:SE-2 scores indicate a need. She finds that a vast majority of her families respond positively and are pleased to better understand what their child is experiencing. However, the process itself can still be challenging. “For some families, it takes a great deal support to help them to understand the questions…and those issues can lead to increased time to facilitate the conversation,” Zickefoose says. She explains that the issue isn’t how the questions themselves are written, but that different families have different needs. TIP: Review the scoring method. Before a caregiver completes SEAM, show them how it works. Explain the four possible responses (very true, somewhat true, rarely true, and never true) and how numerical values are assigned to each response, if these are being used. 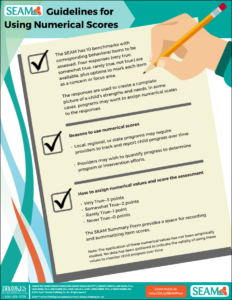 Download SEAM Guidelines for Using Numerical Scores tip sheet. TIP: Encourage thoughtful responses. Tell caregivers to take their time and observe their child if needed, before responding to an item. Remind them that the examples are there just to give an idea of how a behavior might look and that every child is different. TIP: Explain how to report concerns. For each item, have parents check the circle in the “Concern” column if they want to discuss it further. Make sure to follow up! TIP: Explain how to highlight focus areas. Have them check the triangle in the “Focus Areas” column if they want more info, support, resources, or for that item to become an intervention goal. Again, follow up. After SEAM and SEAM Family Profile are complete, and you’ve resolved any questions or inconsistencies, you may use the SEAM Summary Form to record information gathered from both portions. For the assessment, you can include numerical scores (if using), and whether items are strengths, concerns, or focus areas. For the Family Profile, you can note whether items are family strengths, agreed-upon focus areas, or if they want more information. Nancy Miller is an early childhood student services consultant in the Early Childhood/Early Childhood Special Education program in the Blue Valley School District in Overland Park, Kansas. Blue Valley early childhood teams occasionally use SEAM to supplement AEPS® since it allows them to dig deeper and assess a broader array of social emotional skills. Use of SEAM also allows the team to pinpoint more specific goals and objectives for specific children. Although the staff like the tool, they haven’t used it more because they have struggled with how to best write up results in reports. 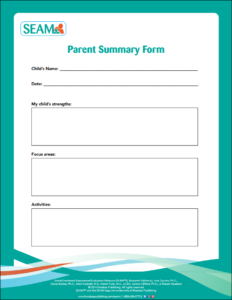 The Summary Form is a useful starting point for communicating results with families, but many programs, like Miller’s, may find that families respond better to another format. SEAM co-developer Misti Waddell, M.S., says when her team was studying SEAM, they created a Parent Summary Form that families found helpful. “It’s just one example of a way to engage families in the process of identifying strengths, identifying areas to focus on, and sharing ideas and activities that can support the development of the identified skill,” explains Waddell. Download the SEAM Parent Summary. One way to use this form is to have the caregivers fill it out as you review results with them. They’ll have something simple to refer to after your meeting, with clear next steps that they helped articulate. TIP: Be timely. Provide follow-up as quickly as possible after the assessment, while the experience is still fresh in the caregivers’ minds. TIP: Show you value confidentiality. Choose a private setting for your conversation and assure parents that it’s confidential. TIP: Don’t rush the results. Dr. Squires stresses the importance of having conversations about results at a time when families and providers are not hurried, and when they can engage in a back-and-forth conversation. “Families need to feel that they are being heard and that their concerns can be addressed, and strengths recognized,” she says. And having an actual conversation is crucial—even if it must be over the phone. TIP: Listen. Give parents an opportunity to express their perceptions of their child, and even if you don’t agree, be open to new ideas and viewpoints. TIP: Tell caregivers: it’s a tool, not a test. SEAM is a tool to gather information. 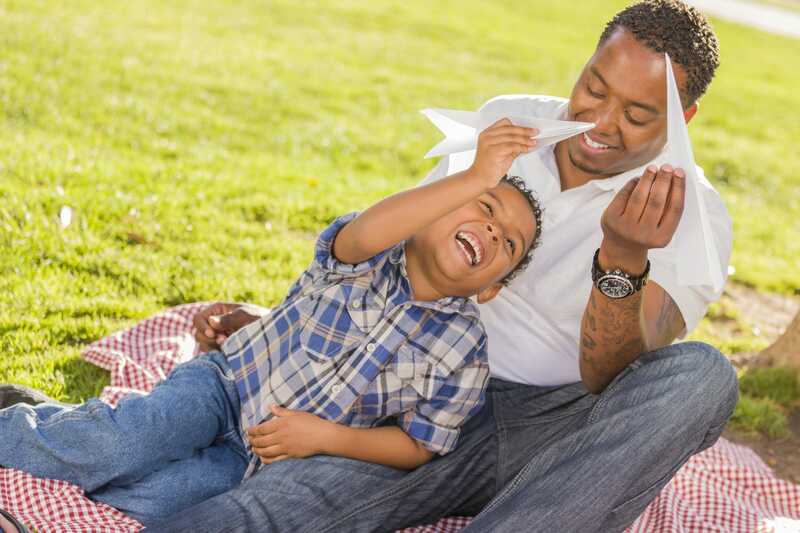 “Families should know that results are merely meant as a guidepost for thinking about goal development, as well as an assessment of strengths and needed supports,” says Dr. Squires. TIP: Consider outside influences. Discuss anything that may have affected results, including cultural, environmental, or health factors. The most important aspect of communicating results with families is setting goals that address areas of concern or focus. Practitioners can then help create activities that support the child’s and family’s development of selected skills, and guide caregivers in providing children with opportunities to practice these skills within the context of daily family routines and activities. SEAM assessment information also can be used to develop individualized family service plan (IFSP) or individualized education program (IEP) goals and family outcomes. Results can be formulated into objective, measurable goals or objectives that can be directly incorporated into intervention plans for children. TIP: Create activities that can be practiced every day. Offer caregivers ways they can address behaviors of concern, but make sure activities are simple and straightforward enough that the family can incorporate them seamlessly. For example, caregivers can practice back and forth conversations during meal and diapering times, or naming emotions while reading books. Waddell and Squires are currently working on a curriculum for SEAM that will offer activities to address different items. “The focus of the SEAM Curriculum will be on embedding best practice strategies into daily routines,” Waddell explains. 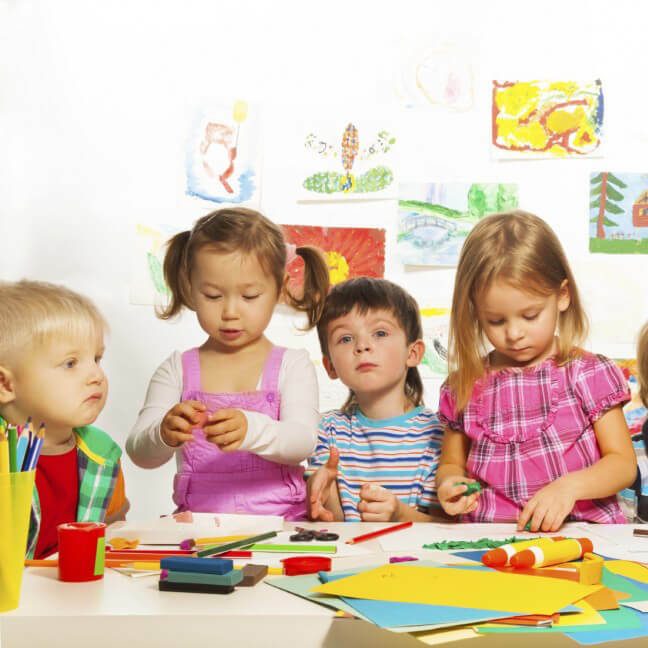 “Follow your child’s lead” to join in their activities. “Name feelings” by noticing the child’s feelings and expressions, and then naming and commenting on both their feelings and their reactions. “First/then” explanations help a child know and be prepared for what will happen first and then what happens next. Make eye contact and try to get close and connect throughout daily routines such as mealtime, bedtime, and dressing. Watch a webinar about using SEAM with young children, by co-developers Jane Squires, Ph.D., and Misti Waddell, M.S. Read about how SEAM and ASQ:SE-2 make the perfect pair.